Current UFC women's bantamweight and featherweight champion Amanda Nunes teases a 125-pound title run. 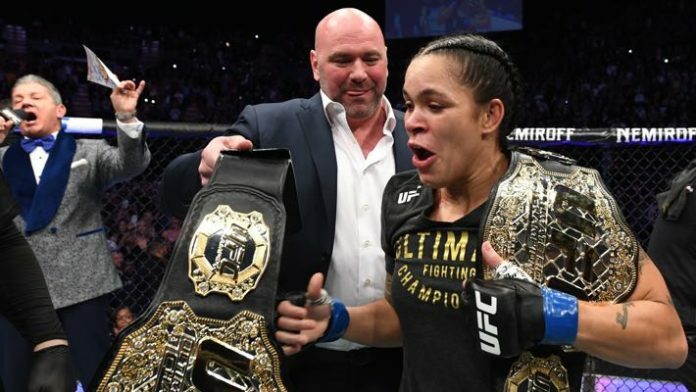 Amanda Nunes could have her eye on making history yet again. “The Lioness” became the third-ever UFC “Champ Champ” back in December when she made quick work of Cris Cyborg at UFC 232. Nunes finished Cyborg in under a minute to win the UFC women’s featherweight title. Now, Nunes reigns as the UFC’s women’s bantamweight and featherweight champion. ”Every time I wake up, I see the belts, and I think I can get more, collect more,” Nunes said. “I know I have the capacity, so I have this will. ”It’s possible. But I need some time. I need a year to get ready. I’m not afraid, but I need time. If I go down this path I’ll take that belt, but I have to be ready. Currently, the UFC women’s flyweight division is run by Valentina Shevchenko. Nunes and Shevchenko are very familiar with one another, as they have fought twice before. Their first meeting took place at UFC 196 in 2016. Nunes won via unanimous decision. “The Bullet” then challenged for Nunes’ 135-pound title the following year at UFC 215. Shevchenko was defeated yet again, this time via controversial split decision. If the two world-class strikers were to run things back at 125 pounds, it would certainly be interesting to see how things play out. What do you think about Nunes possibly going after a third UFC title?